Parkinson’s Disease- The secret of one of the most mysterious diseases, the Parkinson’s disease has finally been revealed. Scientists have now identified a specific brain circuit in one of the most enigmatic regions of the brain; which primarily controls movements. Further to which, it has as well been highlighted that in Parkinson’s disease, the input in the circuit is disrupted. While studying the innate mechanism of brain to control movement, it has been discovered that the red and green signals, i.e. the start and stop pathways controlling person’s ability to move, through transmission of neuronal cells in the brain stem are obstructed. Moreover, the green signal selectively activates glutamate producing neurons, which are responsible for kick starting the locomotion; whereas the red signal inhibits this activation, in order to force an individual to stop. Accordingly, first time ever in the history of the disease, scientists were able to pinpoint the regulatory mechanism of the start and stop pathways, playing a leading role in Parkinson’s disease. The finding has thus been proven to be remarkable in understanding specific regions in the brain producing glutamate, secreting neurons to map out the effective locomotary outcome in neurodegenerative disorders, such as Parkinson’s disease. Several high profile victims of the disease have helped raise awareness of the condition; to the extent that general public have started identifying basic symptoms of the disease. Although, lot of ignorance has still been surveyed; and hence every one need to know more about the disease peculiarities. 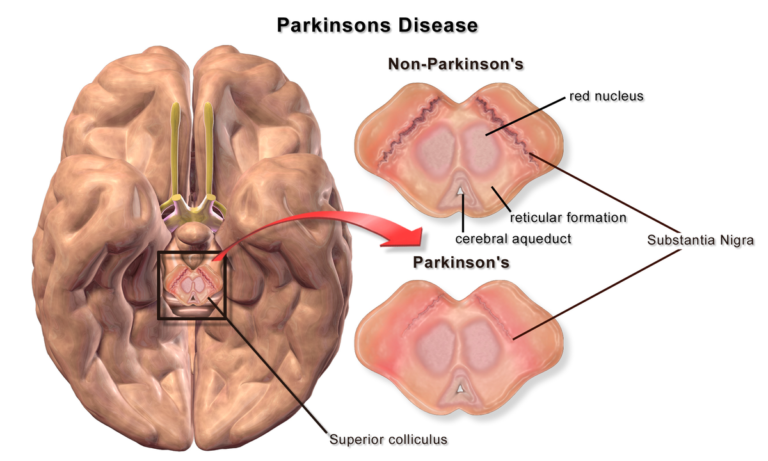 Parkinson’s is an incurable, neurodegenerative condition, wherein people don’t produce enough neurochemical due to neuronal damage; which is responsible for controlling movements and locomotion. Are there any specific symptoms? Primary symptoms of the condition can be noted as tremors, slow movements, dementia, rigidity, etc. along with myriad of general inclinations towards neurodegenerative symptoms, like anxiety, mood swings, depression, etc. Are these symptoms common for everyone? Parkinson’s being a very individualistic condition, its symptomatic manifestation may vary from person to person. At the beginning people may misunderstand it to be a normal age related issue, with lot of non-specific complaints, such as loss of smell, constipation, frozen shoulders, etc. What are other symptoms that have to be noticed for? Does it go hand in hand with depression? It has been commonly studied that more than 50% of the patients suffering with the disability, also suffer from depression and mental disorders. Many patients have reportedly noted to be crippled due to a fear of losing their independence and become wheel chair bound. Research and clinical evidences have supported the hypothesis that exercise and regular physical training can help to initiate a feel good effect in people, suffering with the condition. Further research has as well suggested some of the emotional benefits in order to feel stronger and confident. It has been estimated that the Parkinson’s disease itself will never be solely responsible for your death, but it may at times lead to the complications like trouble swallowing and/or dementia, etc. which can definitely be categorized as fatal. Can it be manageable if not cured? Although, current medical science has no definitive solution for the condition; with the advent of alternative, novel therapies such as stem cells therapy, it is definitely can be manageable with delayed progression and acquiring symptomatic relief. Stem cells are the primary cells of our body, with the ability to differentiate into multiple cell types as per requirement. This potential ability of stem cells has been exploited by the medical science, to regenerate lost neurochemical producing neurons; causing functional restoration of movements in Parkinson’s disease. Latest research on stem cells therapy has definitely ensured a great work by opening the doors for new treatment modalities, to help people with Parkinson’s walk more easily.